Simply the best! - That’s Spring Meadow School’s music club – which scooped first prize at the prestigious Tendring Young Musician of the Year competition. 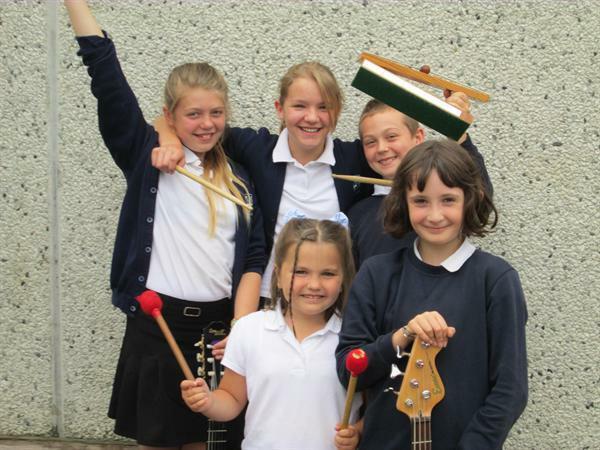 The group – comprising six musicians – took first place in the school ensemble category at the event, organised by Manningtree Rotary Club. Performing two contrasting pieces of music – ‘Radioactive’ and ‘The Gael’, from the film ’The Last of the Mohicans’ the group gave a faultless performance. Music club leader James Martin explained: “We have been working hard as a weekly school club and we set ourselves two very challenging pieces of music. ‘Radioactive’ is a rock song with 2-part harmony and a difficult guitar solo while ‘The Gael’ involves changes of tempo and some extremely fast guitar work – a difficult piece to perform well”. The children played guitars, keyboard, drums, bass and cello as well as providing the vocals to wow the judges and earn their place as Tendring champions !! See Latest News Documents for the Report.